Swayed by the demonic Strange Man, the townspeople have sacrificed their freedom for prosperity. Monsters lurk in every shadow and the few who oppose the new regime have been chased out of town, forced to wage their war in hiding. For ex-reverend Jeff Weldon and those under his care, it is a losing battle, but the tale begins to turn with the return of his brother Dras. Dras arrives at his hometown to find it has descended into darkness – but the worst is yet to come. The Strange Man’s final plan is falling into place and the Dark Hour is close at hand. Dras, Jeff, and the last of Greensboro’s protectors work frantically to unlock the Strange Man’s secrets and uncover the key to stopping the Dark Hour before all is lost. But when Dras discovers the fate of his best friend, Rosalyn Myers, he will realize that he has more to lose in this battle than he ever imagined. 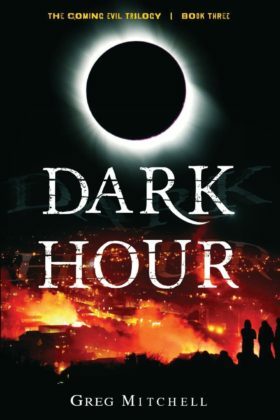 Dark Hour is the explosive final act in The Coming Evil Trilogy. All bets are off as the remnant of light clash with the armies of darkness. The final fates of Jeff, Isabella, Dras, and Rosalyn, along with all of Greensboro, will be decided in a desperate last stand. Book 3 of the The Coming Evil Trilogy series, spiritual-warfare thriller for teen readers and older.